Try This: Verify. Find out what people click, what they remember and more. Building a website isn’t such tricky business. Building one that leads people in the ways that you want them to travel is another story entirely. While your design might make sense to you, it may be as clear as mud to your users. So how do you find out what works and what doesn’t? Verify. Beyond clicks, memory, moods, preferences and even annotation, Verify can also tell you information about what a certain label means to your user and it can show you where people would click in a series of screens. When you want the full idea, you can even link the tests together to get in-depth information from different aspects in a single swipe. So what’s the big idea? The thought is that when you have data such as this, you don’t have to make design decisions based entirely on intuition. While some methods are tested and true, others simply leave too much to chance. Verify will feed you meaningful information from real users to help you better understand why and where they click, what they remember and more. So when Kleiner Perkins–or, in this case, Mark Zuckerberg of sFund partner Facebook–says “every industry is going to get fundamentally rethought and designed around people,” it might be worth taking a listen. It’s about people. Right now we’re at the peak of “social”. Our app Verify is the next part of this equation which Kleiner is talking about- people. 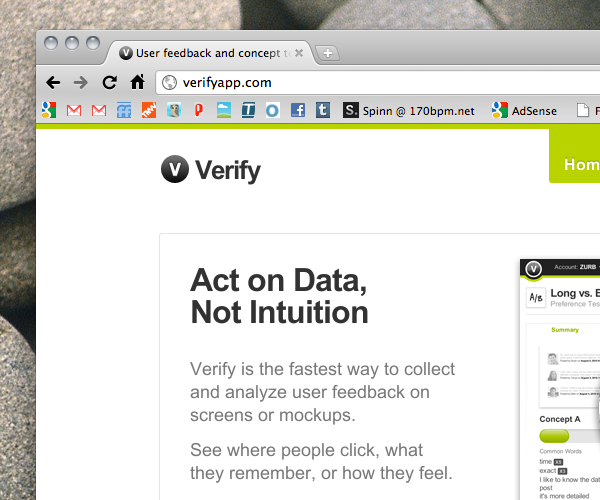 Verify is about designing for people (which is our mantra here at ZURB). The tool helps product managers, brand managers, marketers verify their ideas with their customers before taking those ideas into implementation. It’s a new type of thinking. In order to design for people, businesses need to focus their efforts around the needs of their customers. That means shortening the feedback loop and directing it so that people are put in front and center in the development of websites and products. What’s very interesting about Verify is that it doesn’t fit the molds of testing that we’ve seen before. It’s neither qualitative nor quantitative individually. It combines both elements to provide data that can take your intuition and put it to data before you ever go live. Verify launched today, and will cost you $9 per month for the basic package. If you want detailed demographics and linked tests, you’ll need to step up to the $29 package. However, there is a 30 day free trial for you to find out if it’s the right choice for you. We’re betting that it is, and the results we’ve seen so far have been amazing.